We are delighted to announce that, Daft as a Brush Cancer Patient Care, is one of the local charities that Team Tyne Innovation is looking to support as part of their Talisker Whisky 3,000-mile Atlantic challenge. Daft as a Brush is based in Gosforth. They have a shop in Eldon Gardens and an office and reception desk at the Freeman Hospital in Newcastle. 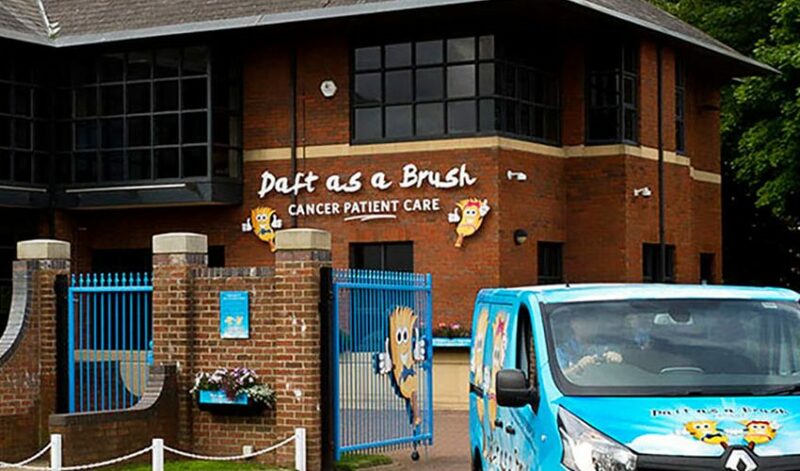 Daft as a Brush provides free transport to cancer patients attending radiotherapy and chemotherapy treatment at the Freeman and RVI Hospitals in Newcastle. Patients are collected from their home in one of the Daft as a Brush liveried ambulances, and transported to the treating hospital. The Daft as a Brush driver and companion will wait until the patient’s treatment is completed, and then transport the patient back home. The patient can bring a friend or relative with them too. Daft as a Brush transports patients from all over the North East and Cumbria; from Berwick to the north, Whitehaven to the west and Teesside and the Yorkshire Dales to the south. Rex Winter, CEO of Daft as a Brush, said “I am delighted that our charity has being picked as one of those the Tyne team is looking to support. Rowing the Atlantic will be no mean feat and I am sure a few of the crew’s friends and family will think they are also Daft as a Brush. We look forward to working with the Tyne Team over the next year leading up to their race in December 2018”.